Shamalamalamadingdong! I went and wallpapered the fridge. Annnnnnnnd it’s amazing. I take no credit in this because I didn’t make the stuff, I just stuck in on there, but wow, this is a good thing. A very good thing. I mean, I have a lot of weird and wonderful things in my kitchen but this sucker is a show stopper. You walk in the room and it hits you like a bag of Thunder Cats. Hey now THAT is a fridge! Can we talk about something for a sec? Appliances. Why are they always so boring? I don’t get it. You spend all this money on something you use every day, shouldn’t it be interesting to look upon? Honestly, not to go all femtator here, but you can tell most appliances are designed by men – they are boring and efficient and look like a blown up version of something you would find under the hood of a car. If, let’s say, washing machines, were designed by women, not only would they have figured out an effective way to keep the washer and dryer drum in one machine (HELLO), it would have a folding station on top that doubled as an ironing board and the front panel would snap on-and-off like a phone case, thus allowing for different colors and patterns like stripes and flowers and pictures of smoosh faced kitties. Is this too much to ask? I SAY, IS THAT TOO MUCH TO ASK? Oddly enough, prior to the popularity of stainless steel, many refrigerators and dishwashers came with pop-on panel fronts – one side was white and one side was black. Manufacturers claimed that people were always welcome to paint one side or the other and customize to their home, but hardly anyone ever did. Why? Maybe because they never knew about it. Maybe because they were afraid. Maybe because they were waiting for a day when they could add their own awesomely patterned skin to their home appliances. Ladies and gentlemen, that day is here: REMOVEABLE WALLPAPER. Now, removable wallpaper has been around for years. I know because I have been looking since 2002, which is the year I moved into a house with an almond front fridge with cigarette burns around the handle (don’t ask). For a long time, removable wallpaper was something plastic and weird. It came with pictures of shells and thistles and patterns otherwise relegated to mortuary waiting rooms. It was also expensive and you had to buy a 25’ roll. Whatev. When Elizabeth contacted me about a new line of removable wallpaper – Chasing Paper – I was excited. Not only did they carry a variety of interesting patterns, they cut it into manageably sized peel-and-stick panels. No soaking in water and hoping that it sticks like regular wall paper. The adhesive is very forgiving so it’s easy to move around and take your time matching seams. The texture is somewhere between wallpaper and contact paper, which makes it 100% wipe-able – perfect for the kitchen. For a while there I thought about using the black and white stripes as a backsplash but settled on the fridge. Also, they have a lot of cool patterns but I liked the hexagon. It’s very David Hicks and is a nice balance to the newsprint on the cupboards. Also, it reminds me of the Stanley Kubric movie, The Shining. So now it’s just me and the fridge and little Tony (RED RUM RED RUM) hanging out in the kitchen each night. I don’t suspect I will get bored this pattern anytime soon, but when I do, I’ll be sure to pop over to check out the latest at Chasing Paper. This green Fern-a-topia has my name all over it! Honest Abe Says… I did not pay for the initial sample of this product. I generally do not accept product in exchange for promotion, but this is one occasion where I felt like sharing. It’s that good. Chasing Paper is a brand new company and I hope you will support their business in delivering a great product. I know I will. *Disclaimer: I was provided with a sample of this product free of charge, for review purposes. This did not alter my opinion of the product and the opinions I have expressed in this post are my own. I am disclosing this in accordance with the United States Federal Trade Commission’s 16 CFR, Part 255. Update April 2015: The fridge got a new party dress. Again! Check out her new look. Wow! I am in.Freaking.Love with this! I LOVE this idea. It is infinitely adaptable. Thank you. And the not-really-ranty rant about male-designed appliances – goes for automobiles, as well. What I wouldn’t give for a flamingo pink, lemon yellow or, perhaps, aqua blue ride with stylish carpeting and upholstery with character. I agree. I don’t even own a car, but if I did, it would need to be flamingo pink. The fact that it’s not even a non-custom option makes me feel judged. Jerks! My aunt & uncle had a salmon pink Oldsmobile with fins when I was a kid and that car has never left my dreams. This is amazing. Particularly the part about The Shining. I might have to get me some Beetlejuice stripes. I love the idea of changing up the look of the fridge. Would you change it for different seasons or holidays? I must say, you did a great job as matching up the image from the top to the bottom of the fridge. Was that difficult? Installation was easy — I just unscrewed the handles off the fridge then started sticking it on, top to bottom — no pre-cutting. Once it was all on there, I went back and used an X-acto to cut a line inbetween the freezer and the fridge and trimmed off the extra paper. Easy peasy. Took about 20 minutes, although I ruined part of the first panel by trying to reverse roll-on like regular wallpaper — my mistake. It takes about $75 worth of paper to cover the whole fridge, so I probably would not change it each season, but maybe once a year or so (if I feel like it). A year ago I would have chosen the polka dot print for sure, now I’m all about Hexagons. I LOVE the idea of a bold black and white stripe fridge in a painted kitchen. I think I may need to gift it to someone else for Xmas. Love the idea. I have to try this! SOOOOOOO freaken awesome! I totally would have done that I spray painted mine…. boring white! It had rust on the front. Peaches, you never cease to amaze me. And the fact that you linked the pattern of the wallpaper to The Shining is perhaps the greatest thing I have ever read. I have been talking about doing this for ages! You just gave me the courage to actually do it. Thanks, Peaches! Another thought. I used to have a very small kitchen that orange or pumpkin color. I liked it a lot. Think about it. All steel and no tessellating patterns make Jack a dull boy. PS If women designed washers and dryers, we would have found a way to make the dryer work as fast as the washer so you don’t have to waste half an hour waiting to switch loads. I know right? Why can’t they sync up the systems?! Did you stick it horizontally? I’ve some adhesive patterned plastic, used for krafts, but is much narrower than my fridge. Yes, I did mine across but their patterns are set up so you can match seams from all sides (each panel is 2′ x4′). It sounds like the paper you have is contact paper — I’m not sure how easy it would be to match seams but you could do it however you see fit. No reason it needs to be vertical if there is no water involved. Oh yes…I lived in Europe for four years — I know the two-in-one machines (this is why I wrote “an effective way….”). They are horrible creatures. But the technology is there so why not improve upon it and make one GREAT all-in-one instead of the eleventy-hundred new models of washer/dryer sets they turn out here every year? If people demand it — they will build it. My dishwasher is begging for this treatment. My husband would flip out (probably not in a good way) if I did it. But he’s not the one spending 3 hours a day in the kitchen, is he? Just last weekend my Mother shared a story with me of her and my Grandma meticulously covering a freezer with contact paper back in the 70’s. My Grandma had a long standing love with contact paper. So your covered refrigerator made me smile, I love seeing a “vintage” idea improved upon an adapted to modern decorating and crafting. It all just circles around and gets better and better! I love it! Now my head is spinning about what design to do mine with, including the dishwasher too. 🙂 Thanks! I love this! and the RED RUM reference. Such a great idea. appliances are so darn boring! I have an almond colored fridge that I like to refer to as “Vanilla” so I don’t spit at it daily for the horrid way it doesn’t match my white cabinets….I regress..I LOVE this idea!!! I can finally love all parts of my fridge because despite it’s color, its is a lovely, well-functioning, nice shelving side-by-side which I feel blessed to have! Thank you! Just love the removable aspect! Redrum…hilarious. I think the fridge looks incredible! Did you use the standard version of the wallpaper or the luxe? Hrm….when I was looking at the site a couple months ago there was only one option, so I’m guessing that means standard. But I’ll double check with Elizabeth at Chasing Paper just to sure. I am going to do this and will use the Chasing Paper. You only needed 3 panels? You said it was $75 so looking at the site its $25 per panel. Just saw this pop up on Design*Sponge! Wop-baba-lu-mop-a-wop-bam-boom! Wow! My daughter is moving into an older house with the old seventies olive green colored appliances. I can’t wait to show her this!!! This is so off-the-hook awesome it made me write “off-the-hook”!! I did a blog a couple of years ago about this odd national steel company promo booklet about doing this same thing. 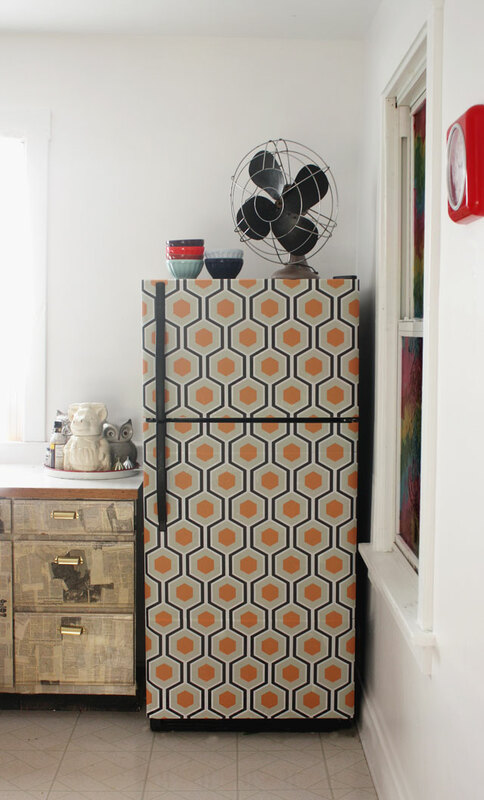 I googled “change my boring white refrigerator” and pow! Your blog was in the search results. I’m doing this to my fridge now! When I’m done with that, I’m checking out the rest of your blog. Pow! After I check out your blog, I’ll research what to do about worn out door gaskets, but that’s on another fridge and for another day. Priorities. 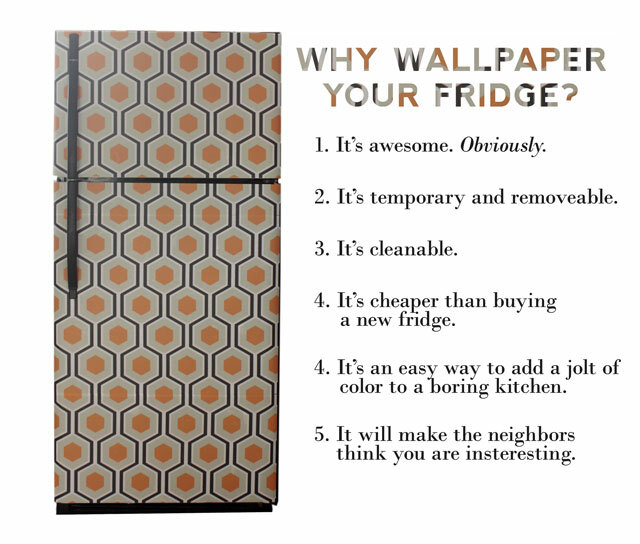 I googled “change my boring white refrigerator,” and pow! Your blog was in the search results. I’m doing this to my fridge now. Now = as soon as I can get the product delivered to my doorstep. After that, I’ll check out the rest of your blog. Pow! After that, I’ll search for how to repair worn out door gaskets, but that’s on another fridge and for another day. Priorities. Awesome idea especially if you live in an apt. Because it is removable but will be awesome. .. while your living in it and making it all your own. love love love. i just found you via pinterest and your fridge. love the hexagon but my brother might never speak to me again if i put something yellow and black in my house (Ga Tech colors) instead of red and black (for his beloved Ga Bulldawgs). Whatevs – think i just might do it anyway! have to say that the combo of the fridge and the cabinets might be my favorite thing ever. newpaper? who woulda thunk it? just might have to try that too. thank you! I love this idea…but I would be amiss, if I didn’t ask you….”Where on earth did you find that owl cookie jar?? ?” I absolutely love it! The little grey owl cookiejar is from World Market (sometimes called Cost Plus — I never know). I think it was $12. Maybe $10. From over a year ago…not sure if they still have it. Good luck! Seems like a nice blog, but I don’t see anything in relation to the fridge/wallpaper? How many 2’x4′ panels did you need to use to cover your fridge? Laying them horizontal, I used three on the front. I had so much leftover I used the scraps + one more to cover the side. In other words — you probably have to do the math depending on how you lay the pattern, but three should be sufficient, four to be safe. Did you find it hard to piece each panel together to keep the pattern? I want to do this to my fridge and am trying to calculate out how much paper/ and the best process. No hard at all. After the handles were off I just applied the paper over the whole thing — straight across the gap. Then I went back with a knife and cut the gap out. You rock! I was thinking of doing something like this when I’m forced to give up my white refrigerator and have to buy a stainless. But in the meantime, I’ll enjoy my white refrig. By the way, I wallpapered one of my bicycles a while back (couldn’t afford to have it painted and I wanted something flowery). Sheets come in 2’x4′ at Chasing Paper, so I’m wondering how many sheets you purchased for your fridge. 3 to do the front. I also needed 2 extra to cover the top half of one side, but you would have to measure your specific fridge. You’d have to check with Chasing Paper directly – I believe they do mostly patterns, no gloss black, but you could certainly try. Good luck! auntpeaches is amazing site for amazing handmade wallpapers and others thing. Carry on auntpeaches! Great idea for the fridge decoration. Sign me up for Aunt Peaches' weekly emails!